Feel free to eat the cookie dough.That statement defies conventional wisdom handed down by bubbes and bakers for years – that eating raw cookie dough can make one sick despite its deliciousness – but it’s the central tenet of a delectable new venture by Katie Pollock and Andy Simms called Dough Street. Traditional cookie dough contains both raw eggs and raw flour, which, yes, can make people sick. But Dough Street uses pasteurized egg whites and heat-treated flour, which Pollock says makes their dough safe to eat. You can even bake Dough Street’s doughs because they aren’t egg-free. Unlike a traditional bakery, Dough Street isn’t bricks and mortar. 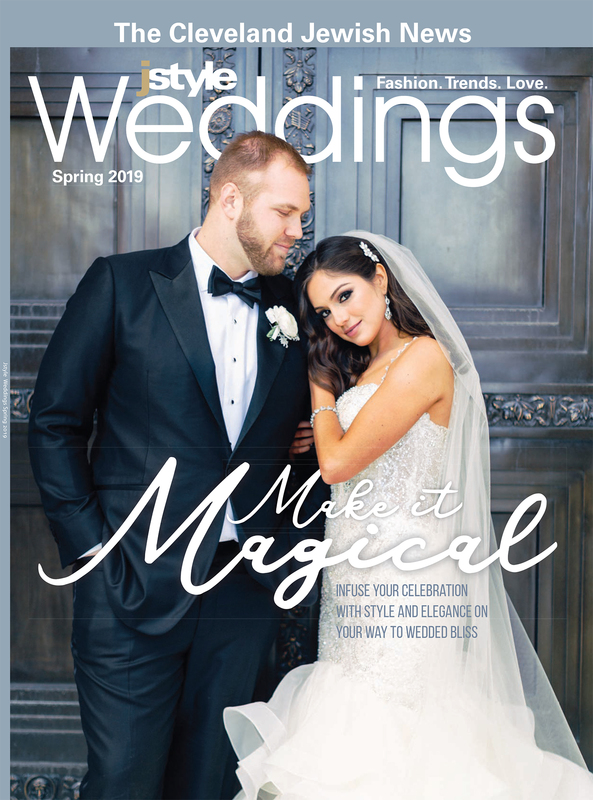 Rather, the couple’s confectionery concept involves a mobile dessert cart that will appear at weddings, life-cycle celebrations, family reunions, corporate events and other occasions. In fact, there’s one very special event already on the calendar. “(Dough Street) will now be (at) our daughter’s bat mitzvah,” Pollock says, laughing. Dough Street co-owners Andy Simms and Katie Pollock make their cookie dough at the Cleveland Culinary Launch and Kitchen in Cleveland. Both Pollock and Simms – Solon residents, parents of 12- and 10-year-old daughters, and congregants at Anshe Chesed Fairmount Temple in Beachwood – have full-time jobs outside of Dough Street. He’s an agent for Dallas-based Young Money APAA Sports, where he oversees football operations. None of his NFL clients had tasted Dough Street’s dough as of early September since they all were in training camp through August, but he said word has spread and many were excited to try it. She’s a head trainer at five different TITLE Boxing Club locations in Northeast Ohio, and together, they’re minority co-owners of the TITLE Boxing Club in Cleveland’s Ohio City neighborhood. So, how did they decide to get into the dessert business? It all started due to Pollock’s love of cookies and baking, but what planted the seed for making a business out of it was a summer 2017 visit to then-newly opened DŌ, Cookie Dough Confections in New York City. Pollock waited in line for 45 minutes to taste it. It was a July 2018 trip to California, during which they found and ate more cookie dough, that got them thinking seriously about launching what’s now Dough Street. They weren’t aware of any places in Northeast Ohio that exclusively or even primarily sell edible cookie dough, so they decided to act. As co-owners, and despite recently hiring some part-time help, Pollock and Simms handle all aspects of the business, though they each take on different responsibilities. Pollock takes care of what she calls the “creative production” end of the business, as well as its social media, while Simms handles many of the business aspects. He’s also tasked with the horrible, awful, no-good responsibility of tasting the recipes. 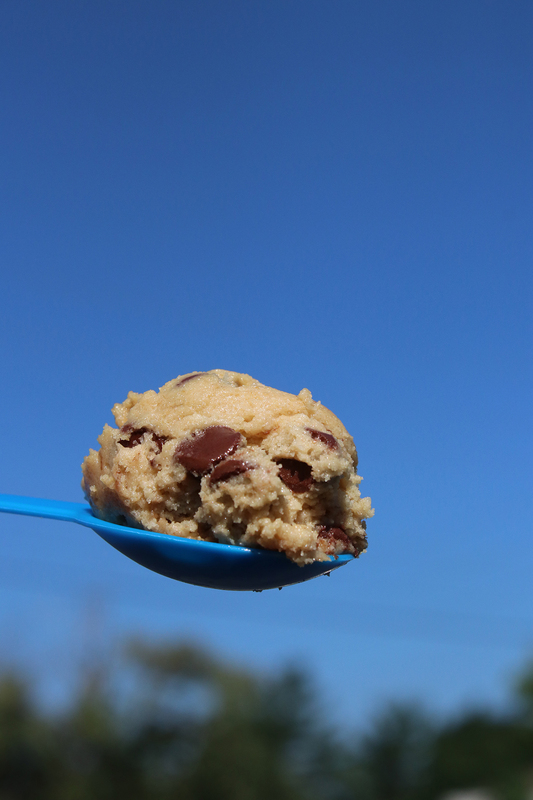 What makes a great edible cookie dough? Simms says he knows a good cookie dough when he tastes it, echoing former Supreme Court Justice Potter Stewart’s threshold for obscenity. Beyond that, the dough’s consistency is important to him. 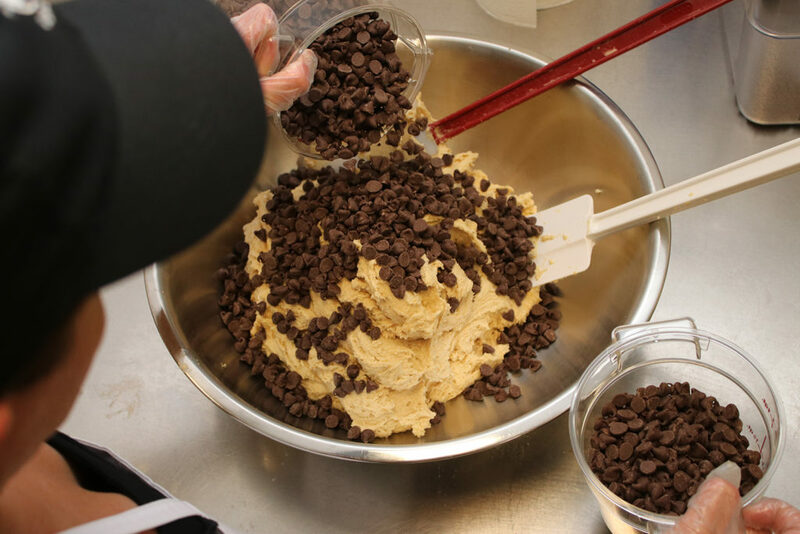 Dough Street’s four flavors – chocolate chip, original (the chocolate chip dough minus the chocolate chips), sugar cookie and gluten-free peanut butter cup – came about through Pollock’s tinkering in the kitchen. The couple is open to experimenting with new flavors but doesn’t plan on expanding the menu anytime soon. Dough Street flavors are served like ice cream is served, scooped, which gives customers the option of eating cookie dough from a bowl or waffle cone. Pollock says bowls have been more popular thus far, but Simms says the couple doesn’t have a large enough sample size yet to draw conclusions. A single 4 oz. scoop is $4, a double scoop $7, and if the customer wants it in the waffle cone, it’s an extra dollar no matter how many scoops. Right now, the waffle cones are supplied by an outside vendor, but making their own cones is something they’re considering for the future. After customers decide on their dough flavor and preferred vessel, they can decide which toppings to add. Current options include M&Ms, chocolate chips and sprinkles, but like the dough flavors, topping selections could expand. “The cookie dough is the prize itself right now,” Simms says. “It’s the star of the show,” Pollock adds. Dough Street isn’t kosher-certified since it’s made in a shared kitchen, but all of the individual ingredients in every flavor of its dough are kosher. The cookie dough isn’t prepared in the couple’s home kitchen but rather at the Cleveland Culinary Launch and Kitchen in downtown Cleveland. Pollock researched obtaining a license for having the company’s kitchen in their house, but they needed a bigger mixer to make large batches of dough. She learned about the culinary kitchen from friends who had used it. “I called (the culinary kitchen) and said I need information. The owner said, ‘Do you want to come to an informational meeting?’ and I said, ‘No, I want to start tomorrow!” says Pollock, laughing. Pollock and Simms work together on a batch of chocolate chip cookie dough. Dough Street had its first “test run” Aug. 18 at Solon Pop-Up in the Park, where Pollock and Simms planned on selling for the event’s full five hours but sold out of their dough in just three hours. They plan to do more local events, like the Cleveland Flea, but would also like to eventually be on shelves at local grocers. They plan to begin online sales in the next few months. “We’ll see where it takes us and where it goes, but right now, we’ve got a fun product and people want to try it,” Simms says. “We just really wanted to bring this to the community. Nobody in Cleveland was doing just cookie dough, so we felt like there was an opening for it and people were going to enjoy it,” Pollock says. Despite time constraints put on them by their other full-time endeavors – including as parents – they’re committed to making Dough Street a success. For more information, visit doughstreetusa.com.